Life is a Miracle – A Penny Black card! I have a very colourful card to share today! I made this card using Penny Black stamp sets and dies. I started with a white cardstock trimmed to 4 x 5.25 inches. I randomly trimmed a masking paper to mask off the bottom of the card panel. Then I sponged Picked Raspberry, Abandoned Coral, Seedless Preserve and Dusty Concord Distress Inks. Went back and forth until I got the blending right. Then I masking the sponged side and sponged Crushed Olive and Mowed Lawn distress inks. Again going back and forth until the colours blend evenly. Then I spattered with some clean water. Once dry, I stamped the leaves from You & Me stamp set in black. I use Versafine Black pigment ink. This ink gives a clean and detailed finish. Then I glued the Wonder & Joy die cut in gold glitter cardstock. Stamped the sentiment from Season’s Gift stamp set in black. 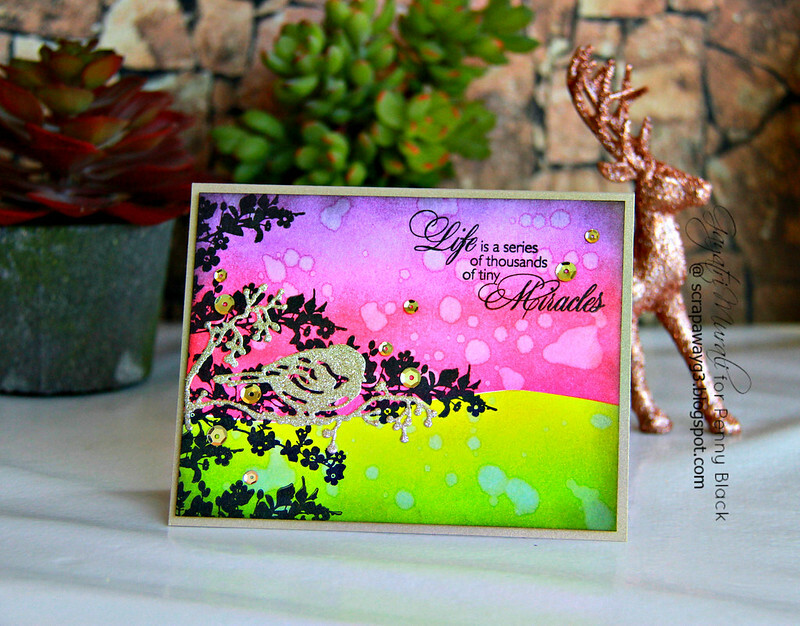 I adhered this panel on to a gold cardstock and embellished with Pretty Pink Posh Gold 6mm and 4mm sequins. Here are the Penny Black stamp sets and dies I have used to make my card: Wonder & Joy die, Season’s Gift stamp set and You & Me stamp set. 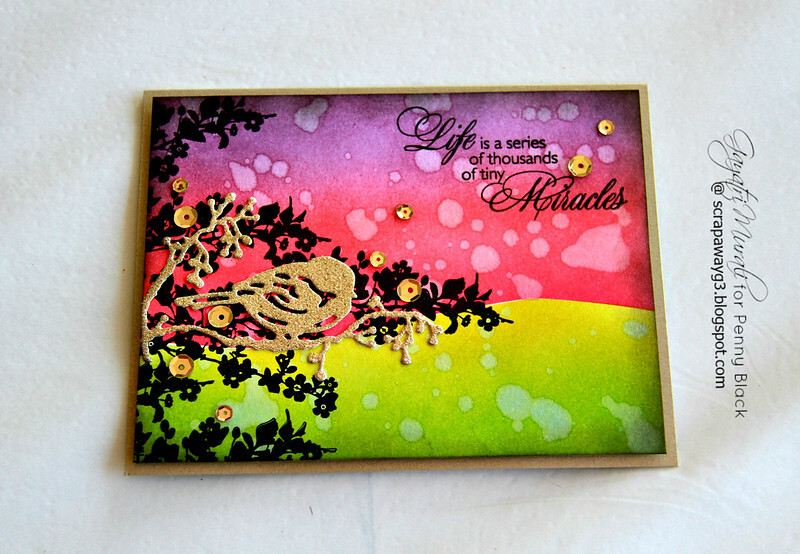 LOVE the sentiment, LOVE the background, LOVE the leaves, LOVE the golden bird on the brand die cut too!!! Fabulous creation!! The colors are so pretty. Nice silhouette images. Love the glitter die cut bird. Beautiful card Gayatri. Love the vibrant colors and the heat embossing.